Notes: Common in open woodland and hedgerows throughout most of the British Isles. In south Hampshire, recorded in small numbers in most years, but distinctly uncommon in north Hampshire and on the Isle of Wight. Wingspan 10-12 mm. 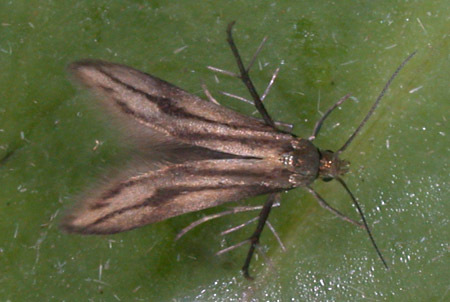 The moth rests on forelegs and midlegs only, with the hindlegs raised and projecting obliquely over the abdomen, a resting posture shared only by the otherwise dissimilar Stathmopoda pedella. Larva feeds on Raspberry and Bramble, beneath a silken web, over-wintering as a pupa.